The unit is ideally located on the ground floor on the absolute beachfront at Palm Beach. The apartment is North facing and is slightly set back from the front so you can still enjoy the ocean view without the severe winds that can hit the very front. The apartment has recently been newly painted and updated bedrooms furnishings. It offers 2 spacious bedrooms and 2 bathrooms. The two ensuites offer queen beds, with ocean views. 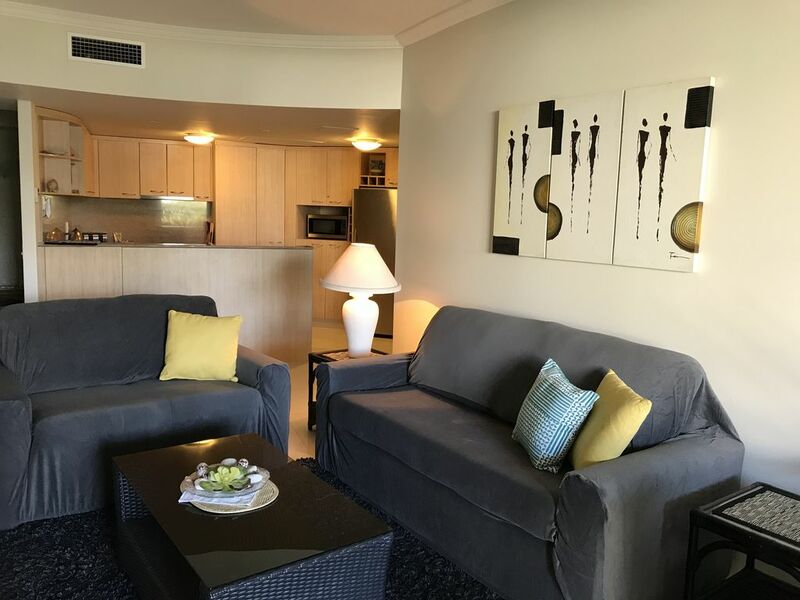 The lounge room is comfortably furnished and provides TV, DVD player, No Foxtel as the prime position of beach front and focus on outdoor activities should not be wasted !! You will enjoy cooking in the fully equipped kitchen with dishwasher and luxurious features including stone benchtops and flooring. Step out to your huge outdoor terrace, complete with comfortable furnishings, a BBQ and a stunning ocean views. It is only a few steps down to the golden sands of Palm Beach. This apartment is not suitable for Pets (The management of Palm Spring Residences do not allow Pets on site except by prior application and approval for local residents ). Holiday properties are equipped with blankets/doonas and pillows and protectors, however please remember to bring your own personal linen including sheets, pillow cases, towels and tea towels. Great location and well fitted. The unit is in a great location and has everything you need. The ground floor has the perfect outlook of the ocean and the gardens. The swimming pool and gym area is fantastic. Parking underground is secure. The location right on the beach is perfect. The unit and the whole complex is very clean and well maintained and the residents are friendly. Definitely recommend this place.